^ 2.0 2.1 2.2 Tucker, Spencer C. Vietnam (Google Book Search). University Press of Kentucky. 1999: 29. ISBN 0-8131-0966-3. ^ Chapuis, Oscar. A History of Vietnam: From Hong Bang to Tu Duc (Google Book Search). Greenwood Publishing Group. 1995: 195. ISBN 0-313-29622-7. ^ Barbara Wertheim Tuchman. The march of folly: from Troy to Vietnam. Random House, Inc. 1985: 235 [2010-11-28]. ISBN 0-345-30823-9. ^ Larry H. Addington. America's war in Vietnam: a short narrative history. Indiana University Press. 2000: 30 [2010-11-28]. ISBN 0-253-21360-6. ^ Peter Neville. Britain in Vietnam: prelude to disaster, 1945-6. Psychology Press. 2007: 119 [2010-11-28]. ISBN 0-415-35848-5. ^ Van Nguyen Duong. The tragedy of the Vietnam War: a South Vietnamese officer's analysis. McFarland. 2008: 21 [2010-11-28]. ISBN 0-7864-3285-3. ^ Stein T?nnesson. Vietnam 1946: how the war began. University of California Press. 2010: 41 [2010-11-28]. ISBN 0-520-25602-6. ^ Elizabeth Jane Errington. The Vietnam War as history: edited by Elizabeth Jane Errington and B.J.C. McKercher. Greenwood Publishing Group. 1990: 63 [2010-11-28]. ISBN 0-275-93560-4. ^ The Vietnam War Seeds of Conflict 1945 - 1960. The History Place. 1999 [2010-12-28]. Duiker, William. The Rise of Nationalism in Vietnam, 1900-1941. Ithaca, New York: Cornell University Press. 1976. ISBN 0-8014-0951-9. Edwards, Penny. Cambodge: The Cultivation of a Nation, 1860–1945. Honolulu: University of Hawaii Press. 2007. ISBN 0-8248-2923-9. Evans, Grant. A Short History of Laos. Crow's Nest, Australia: Allen and Unwin. 2002. ASIN B000MBU21O. Marr, David. 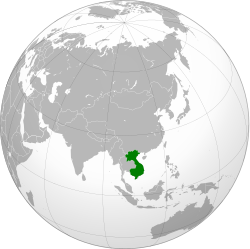 Vietnamese Anticolonialism, 1885–1925. Berkeley: University of California Press. 1971. ISBN 0-520-01813-3. Marr, David. Vietnamese Tradition on Trial, 1920–1945. Berkeley: University of California Press. 1982. ISBN 0-520-04180-1. Marr, David. Vietnam 1945: The Quest for Power. Berkeley: University of California Press. 1995. ISBN 0-520-07833-0. McLeod, Mark. The Vietnamese Response to French Intervention, 1862–1874. New York: Praeger. 1991. ISBN 0-275-93562-0. Murray, Martin J. The Development of Capitalism in Colonial Indochina (1870–1940). Berkeley: University of California Press. 1980. ISBN 0-520-04000-7. Osborne, Milton. The French Presence in Cochinchina and Cambodia: Rule and Response (1859–1905). Ithaca, New York: Cornell University Press. 1969. ASIN B000K13QGO. Stuart-Fox, Martin. A History of Laos. Cambridge, U.K.: Cambridge University Press. 1997. ISBN 0-521-59235-6. Tarling, Nicholas. Imperialism in Southeast Asia: "A Fleeting, Passing Phase". London and New York: Routledge. 2001. ISBN 0-415-23289-9. Tully, John. France on the Mekong: A History of the Protectorate in Cambodia, 1863–1953. Lanham, Maryland: University Press of America. 2003. ISBN 0-7618-2431-6. Woodside, Alexander. Community and Revolution in Modern Vietnam. Boston: Houghton Mifflin. 1976. ISBN 0-395-20367-8. Zinoman, Peter. The Colonial Bastille: A History of Imprisonment in Vietnam, 1862–1940. Berkeley: University of California Press. 2001. ISBN 0-520-22412-4.